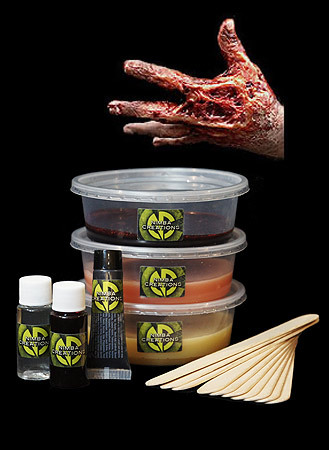 Use the SkinWizard Instant Burn FX System create 3D burn make up effects directly on the skin – no need for moulding casting or painting, just instant results! 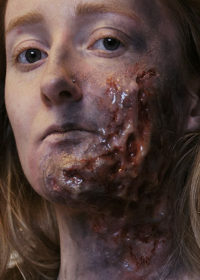 The kit includes flesh, fat and blood coloured gels to build up the burned effect and use the liquid blood, gel blender and black paint to complete the look. The kit also includes 10 wooden spatulas and written instructions. INSTRUCTIONS; Test on small area of skin before use; if any adverse reaction occurs, discontinue use. When melted, always test temperature of gelatine before using on skin. Do not boil. Protective clothing should be worn when handling hot gelatine. Keep out of reach of children. Avoid eye and mouth areas. External use only.